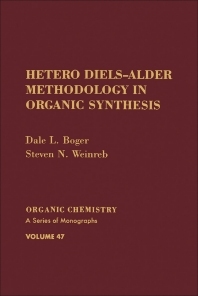 Organic Chemistry: A Series of Monographs, Volume 47: Hetero Diels-Alder Methodology in Organic Synthesis focuses on the use of hetero Diels-Alder reactions as pivotal steps in natural product total syntheses. The publication first offers information on N-sulfinyl compounds and sulfur diimides and imino dienophiles. Discussions focus on sulfur dioxide and related compounds, selenium dioxide, sulfur diimide cycloadditions, regiochemical, stereochemical, and mechanistic aspects, iminium salts and neutral imines, oximino compounds, and intramolecular cycloadditions. The text then takes a look at nitroso and thionitroso dienophiles and carbonyl dienophiles. The manuscript elaborates on thiocarbonyl and selenocarbonyl dienophiles and miscellaneous dienophiles. Topics include nitriles, azo compounds, selenoaldehydes, thioketones, thioesters, dithioesters, and related compounds, and thiophosgene and related compounds. The text also ponders on oxabutadienes, thiabutadienes, and azabutadienes. The publication is a valuable reference for chemists and readers interested in the Hetero Diels-Alder methodology.